Almost exactly 6 months ago, I posted about how you could create a Planting family that had a complex, scaleable plan graphic. The entire process involved creating a rather complex framework and was limited to using splines. However, a while later I learned that neither of those are necessary. So here is the slightly simpler (and much less time consuming) way to create a complex, scaleable planting graphic. It is slightly simpler because it does not involved a framework and constraints, but it does involve nesting a Detail Component into a Planting family, and then nesting that Planting family into the main Planting family. But again, the Detail Component is only necessary if you want to give your Planting family some color. So, starting in the Detail Component, create a Filled Region using any type of line (straight lines, arc, or splines). If you are doing this for the first time, I would recommend starting with a simple shape (such as a circle or a simple polygon). Once the entire chain of nested families has been set up correctly, you can go back and modify the Detail component to be as complex as you want. Also, be intentional about the size of the component. I started with a 10′ diameter. Then, create a new Planting family. Load the Detail Component into the Planting family and change the Height parameter to match the size of the Detail Component (which in this example is 10′). This Planting family should also be Work-Place Based if you want the Detail Component to cast shadows and not embed into Topo. Load the first Planting family into the main Planting family. This final Planting family should also have the 3d representation that you typically use for Plantings. First, place the nested Planting family on the upper reference plane. If the Detail Component disappears after doing this, then you probably also need to adjust the View Range (and move the Cut Plane up). Then, select the Detail Component and Edit Type. In the Type Properties, click on the little button to the right right of the Height parameter. Associating the Height parameter (of the nested Planting family) will allow you to control the width of the Detail Component independently from the Height. I use a parameter called Width Control. For some reason, the nested Height parameter cannot simply be associated to the Width parameter. I tried to do this initially, but it resulted in the Detail Component scaling inversely. After some testing, I found a formula that worked correctly. It involves the Width, Height, and initial size of the Detail Component (which in this example is 10). If you would like to take a look, here is a Planting family that was created using this method. Create all of your linework in the nested Planting family (and not in the Detail Component). This will allow you to use Planting line subcategories. The nested Planting family will not behave correctly until loaded into a project file. It will not scale within the Family Editor and it will also appear to be layered incorrectly. Hi Melonie, thanks for the in-depth comment! 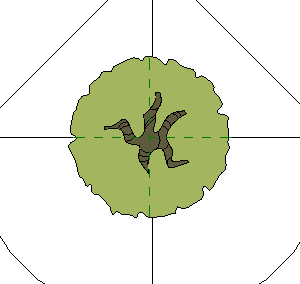 I have also considered using a detail component in elevation, but my concern is that it would not be visible if a section or elevation was not orthogonal to the Planting family. Perhaps this is not an issue or you have found some sort of workaround? I would be interested to know. As another option I have looked into creating very thin sweeps (similar to RPC, but customizable). If you insert the detail component into a model family twice (once on the “back” elevation, and once on the “left” elevation), your elevation and section will work if you rotate the tree (at least, my testing is showing that it works) to be “facing” your section or elevation. If I could post images, I think I could explain it better! 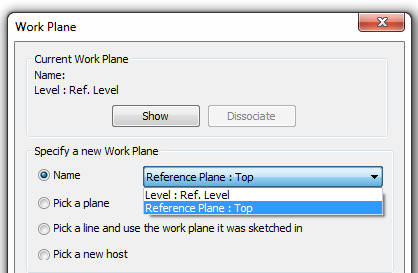 Thanks for all your posts – it has been a huge lifesaver to read tips, tricks, and general insight towards revit from the perspective of a landscape architect! I think I am missing something in the early stages of this process – how is your polygon associated with the height parameter? 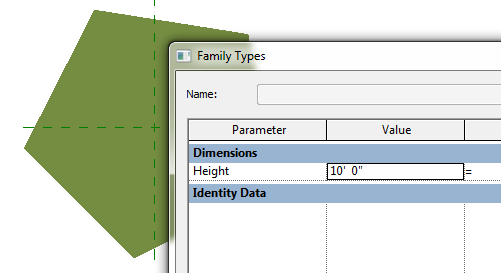 (Im trying to use imported cad tree blocks, but I dont think that should matter…) As far as I know, I need to associate the content of the first family with a parameter (and here you use height), and then in the second family associate height with an additional dynamic parameter… but I cant figure out how to associate anything more than a circle with a diameter annotation to the height parameter in the first family? Hi Matt, I think you are missing the first part, which is a Detail Component Family (not a Planting Family). If you are trying to recreate it, I would recommend downloading the file I provided, that way you can look at all of the nesting and parameters. And you could even use my file as a starting point if you wanted.